SAN DIEGO, CA. – Dimension Data has created a sports technology practice. The global IT solution provider never actually planned to develop this specialized area, but after the success of its Tour Du France technology partnership with the Amaury Sport Organization the company realized there is a substantial business opportunity in the world of sports. Etienne Reinecke, the CTO of Dimension Data in an exclusive interview, said the sports group was never part of any general execution strategy. It all started as an exercise to extend Dimension Data’s brand in the marketplace. “We were not looking to establish ourselves as a consumer brand, but an enterprise brand and started looking for vehicles to take back to the project team that could give us exposure, but also aligned with our corporate values of teamwork, high performance and an all-hands-on-deck culture. That’s what we wanted our brand to reflect,” he said. Initially Dimension Data got approached by a Formula 1 team, which gave the company a glimpse of what sports and technology would look like. But Reinecke said the company decided to work on the Tour De France because it could dramatically impact that sport through technology over Formula 1 as that motorsport was already saturated with IT. “We thought we could make a real difference in cycling and the sport also embodies our values. As we began to dig into the sport we learned that IT was not pervasive at all. It was a sport devoid of technology. So we thought it would be easier to make an impact as it was a greenfield opportunity,” he said. The 2015 Tour De France consisted of 198 participants; part of 22 teams. The teams also employ more than 300 support staff helping these riders win stages. Each racer had a sensor under the saddle of the bicycle. The sensor was able to determine cyclists are capable of speeds up to 104 kilometres per hour. This type of data collection was never possible before. For the 2,000 members of the accredited media, Dimension Data captured analytics that showed highest and lowest average speed per racer, the distance between first and last competitor, and highest sprint speeds for each stage of the race. 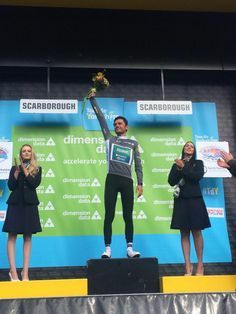 Last year’s race also incorporated social media as Dimension Data was able to track Tweets from fans to determine which racer distinguished himself as the most aggressive, producing the greatest effort during the stage, and demonstrating sportsmanship. The winner was presented with the digital jersey in three of the stages of the Tour De France. Frenchman Perrig Quemeneur of the Coureur Cycliste Pro Team Direct Energie team was the first winner of the grey jersey. After the race, won by Chris Froome of Great Britain for the Sky Team, Dimension Data captured data from 42,000 geospatial points and 75 million GPS readings. For example, Formula 1 racing cars typically carry 180 sensors, while bicycles don’t have any sensors. By adding sensors cycling teams can now capture heart rates, oxygen intakes, power ratios and inevitably could prevent doping. Fisher was quick to say that Dimension Data does not have plans to develop this feature from sensor data, but it shows the potential of what can occur with technology. The new sports practice is intended to drive revenue and Dimension Data is working on monetizing its solutions in this group which includes weather data, climate data, and data-based training apps. One of the training apps can show how a rider performs against the Tour De France champion. The solution provider already has Cisco and Intel on board as vendor alliance partners. Cisco CEO Chuck Robbins that he has been briefed by Dimension Data on its new sports practice and he supports how technology is changing and improving the fan experience. “I have good a friend who runs the analytics strategy for the University of Pittsburgh basketball team and all the teams and industries are not ignoring this trend. There is value in the data and you will see a team win a world’s championship one day who may not look on the surface to be a competitive team. You are going to see things like how a player plays in the first six minutes of a game matter on if he will be on the court in the last two minutes of the game,” Robbins said. Reinecke added that some of the sports technology developed can be replicated for healthcare and in the animal conservation area. Dimension Data is working with Connected Conservation of South Africa to protect the Rhino population. According to Reinecke, approximately 1,500 Rhinos have been killed by poachers in the last 12 months and there is only 12,000 of the species left.